"Why do I need a crown on my tooth?" There are many reasons why someone needs a crown on their tooth. The most common reason is the tooth is more filling than tooth. The filling relies on the tooth to be stable. Basically the tooth holds the filling. When a tooth can't stabilize a filling, a crown is used to make the tooth stable. Often a large filling has been in the tooth for years. Just like a set of tires, the filling wears down over time. Eventually it starts to break down and lose its seal within the tooth. When the dentist sees the filling breaking down he has to make a decision. Can the filling be removed and a new filling placed? Or is there just too much tooth gone? Most dentists rely on experience to make that call. It is a difficult call to make for multiple reasons. Primarily it's hard to tell a patient they need a more expensive procedure (crown vs. another filling) when they are not experiencing any pain or discomfort. Patients often want to wait until the tooth becomes symptomatic/painful before doing a crown. We never push any treatment. The problem is pain often means you'll need a root canal in addition to a crown. Often a root canal can be avoided if we do the crown before pain or a tooth ache become part of the problem. Another major reason a crown is needed is due to a crack in the tooth. Teeth that have cracks sometimes are painful to chew on. People tend to say, "I get a zing every time I eat something hard and thin". Other times their tooth is very cold sensitive. It does happen that the crack is visible in the tooth, but THERE IS NO PAIN. Finding the crack before there is any pain is a good thing. Many times I hear, "well, it doesn't hurt, I'll just wait until it hurts and then we can fix it". 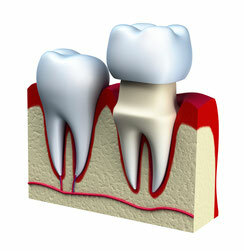 If a tooth has a crack and it is painful it may require a root canal to relieve the symptoms. A crown is currently the most predictable way to treat a cracked tooth. It covers the tooth and keeps that crack from growing. Sometimes that crack will grow and the tooth will split and the tooth will need to be extracted. Other times the crack will grow into the nerve, and the tooth will require a root canal to save it. That brings me to the next most common reason for a crown. Most of the time a back tooth has had a root canal it needs a crown. There are RARE exceptions. If you already had a filling in your tooth, or you have a large cavity that made it necessary to have a root canal, then you will probably need a crown. On front teeth you will need a crown if you have a large filling in the tooth. Front teeth don't take as much pressure while chewing as back teeth do. The are not as susceptible to cracking. Another reason to do a crown is for cosmetic purposes. Some people have dark, discolored, or poorly shaped teeth. Crowns are a way to get a nice, esthetic, result fairly easily. They can make a big difference in a short amount of time.